Nestled in the heart of New Brunswick's Miramichi River valley, the W. W. Doak fly shop has been in business for over 70 years. Spanning three generations, we are family owned and operated, offering a wide variety of Atlantic salmon fishing tackle and accessories. Our store is open year round and our mail order division regularly ships all over North America as well as Europe and parts of Asia. We specialize in an extensive selection of Atlantic salmon flies and hand tied salmon leaders all of which we produce exclusively in our shop on the banks of the Miramichi. why not drop by our store. 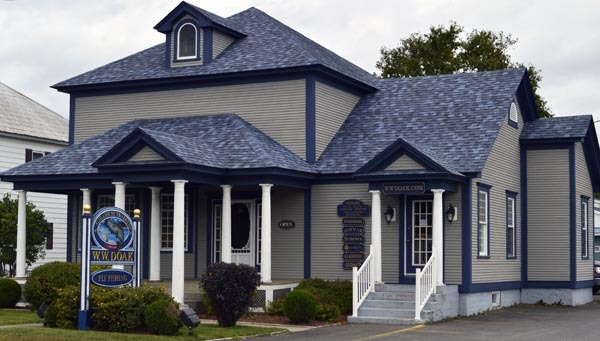 We're located in Doaktown, on Route 8 in the heart of the Miramichi river valley (street view), right across the street from Tim Hortons. We're just an hour from Fredericton, 50 minutes from Miramichi City, 100 minutes from Moncton and 2 hours from Saint John. We're open all year long, as well as all Summer statutory holidays but remember, we're always closed on Sunday. For detailed directions and specific info, call (506) 365 - 7828 anytime. We'll be glad to help. As many of you know, we have printed and circulated a catalogue for over 25 years. However, wide variations in currency exchange rates and rapidly changing product specifications have made it harder to accurately predict long term prices and availabilty. As a result, we have chosen to suspend catalogue publication for the the time being, and to direct our efforts toward updating our website regularly with current product and price information. Please check back often to make sure that you are up to date. If you wish to place your name on our mailing list for any future publications and/or email updates, please click here to submit your details.